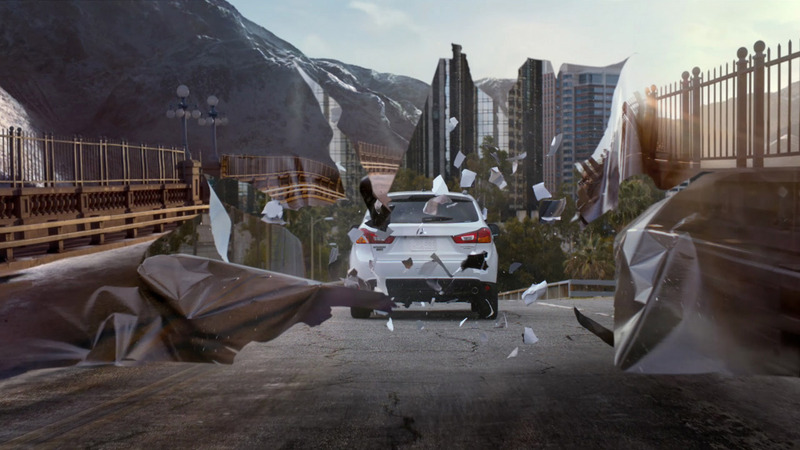 Mill joined Stylewar and 180 for another stand out commerical for Mitsubishi. The creative collaboration is transparently clear in Tomorrow, a clever and aspirational 30-second spot made to promote the Mitsubishi's stylish new design, super all-wheel control, and hill start assist. "Working together with both Stylewar and 180 was great, the team worked really well together, said Robert Sethi, creative director at Mill "How the car breaks through to the next environment was based on real world tests that had been done early on and discussed by the entire team and it got everyone one the same page quickly - so when we did the live action shoot we where always breaking through real material." That served as a base for all the vfx breaks, in some shots Mill extended the breaking paper and replaced it all in cg; it was based on live action references. "As the 2D compositing team lead, it was our role to try and integrate the 3D breaking worlds to look as seamless and realistic as possible. To do this we tried to use as much of the real world environment as possible, such as dust elements, and then tie these in with 3D elements, such as floating debris and dust elements," said 2D lead artist, Adam Lambert." "We wanted to try and enforce the idea of breaking into different worlds, and the plates between the two worlds are quite different in terms of color and contrast," said Mill producer Jordan Sharon. "Every shot included visual effects assets from light flares and particles, to removing electric pylons down the PCH."